Thought I was taking the foot off the gas did you? No chance! I just thought that given my surplus this year, I should try and take on something a bit more hefty. I've been meaning to read Trollope for years now as he is one of my father's favourite authors. Interestingly, I've been held back by the same reason I avoid a lot of fantasy epics: I didn't know where to start and didn't want to jump into the middle of a series. For you see, Anthony Trollope is kind of a nerd author. Most of his books are part of a multi-volume series all taking place in an imagined world (though cleaving very close to the realities of mid-nineteenth century England). 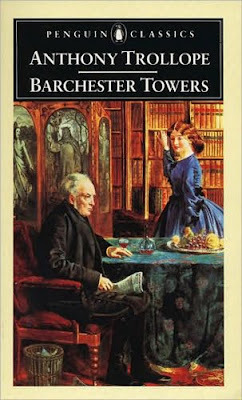 Barchester Towers, for instance, while being the best-known and most popular of his books, is actually the second in the six novels of the Barsetshire series. They follow the paths of several players in the political and social dramas surrounding the clergy of Barsetshire County. There is even a map. At this time, England is evolving from a society where the Church of England is basically the government to one that is becoming more and more secular. It is still extremely early in this process and the church still acts as the local government and community center in rural areas. The changes take the form of reforms and conflicts between the more modernistic, evangelical Low Church and the more traditional, formalized High Church. I knew very little of any of this history before reading this book and I still only understand it superficially. Ultimately, understanding the politics and history is not crucial to enjoying the story. John Kenneth Galbraith (of all people) even argues in a preface that the substance of the politics are not even important to Trollope. I would say that they are not of prime importance, but he quietly puts forth an argument for traditional stability and a relaxed, practical approach to religious observance (in contrast to the more fervant fidelity of the Low Church supporters, who I suspect are related to the pilgrims who came to America). You can see in Trollope that stoic, slightly bemused attitude that propelled her to colonial superiority over their swarthier or flightier european adversaries (and even to this day separates Britain from the rest of the english-speaking world, despite Tony Blair's attempts to drag it down to the angry trenches of North American self-importance and righteousness). The story itself is about the newly appointed Bishop (who is the religious leader of the entire county), Dr. Proudlie. Because of his relatively evangelical and Low Church views his appointment is seen as a dangerous, destabilizing blow by the existing clergymen of Barsetshire, led by the Archdeacon, Dr. Grantly. The bishop comes with his controlling, meddling wife and his controlling, meddling chaplain, Mr. Slope, who are initially united in their evangelical fervour for reform, but soon become at odds. Politics, drama and romance ensue. The first half focuses on the political conflicts and the second half moves more into the romance, which resembles some pretty classic British Victorian romance novels, where you really want the good lovers to get together. I enjoyed the political maneuvering more, but was caught up in the story sufficiently that I was very eager to follow the romantic threads to the end. What makes the book great is the engrossing and thorough way that Trollope describes all the characters and their role in this world. He has a benevolent but wry perspective and even renders himself as author visible from time to time which would seem to take you out of the fiction, but actually succeeds for the most part in making you more connected to it. You gain confidence in his voice as he explains where he may be at fault or lacking as an author before it can actually happen in the text. There is a great part early in the book, when you as the reader are quite concerned that a good widow is going to make a poor choice of husband between two unappealing suitors. Trollope jumps in and assures you that she will choose neither of them and then goes on to say that there is no need for him to hide that information from you for the facile purpose of keeping you in suspense until the end. That is a lesson many writers today would do well to heed! Now that I've read Barchester Towers, I look forward to hearing why my father likes them so much. For myself, I can definitely see me continuing to move forward in the Barsetshire series, to envelope myself again in that pleasant, sensible, pastoral world where despite the swirl of conflict around them, people speak to each other in polite, measured ways. S.W. Welch, he's good. He's real good.